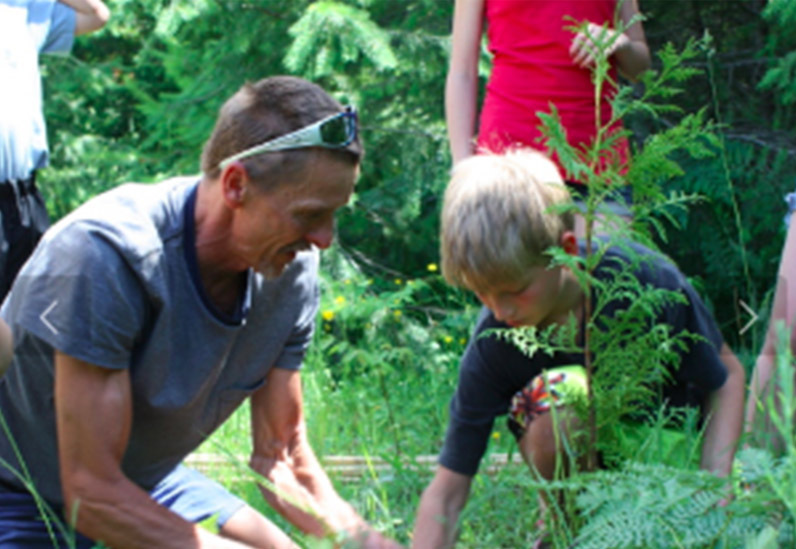 Roland is the main aikido instructor and builder of the White Pines Dojo / Kootenay EcoRetreat Centre. His vision was to create a space for people to share the principles of harmony with each other and nature. He feels that participants have the opportunity to study nature and practice the art of harmony through stewarding the surrounding land. He envisions a self-supporting, sustainable, energy efficient, ecological system that allows the vitality of the environment to sustain the participants. Practice mindfulness while working in the organic garden and orchard, campground maintenance or harvesting the medicinal plants of the forest and meadow. For over 35 years, Ken Nateshvar (Sanskrit for "Lord of the Dance") Scott has been internationally recognized as a pioneer, leader and innovator in the field of yoga and dance, and the creator of iconic expressions of classic hatha yoga. His yoga practice is elegant, graceful and deeply personal, emphasizing movement and posture flow to create a sensual, emotionally and physically rewarding experience. For Tesh connection and union with each and every one of his students is the heart of his teaching. Tesh is the co-creator of Contact Yoga: The Yoga Of Relationship, the landmark practice that brought yoga off the solitary mat and into the realm of connection and relationship. Tesh has served as a trainer and transformative guide to many top athletes, actors, executives and politicians throughout the world and has been featured in Vogue, W and The New York Times. Self Magazine named him one of the top ten yoga instructors in the United States. Hamsa (CYT, ERYT500) has been teaching yoga for 20 years and working as a Yoga Therapist for 8 years, certified by the Ananda Seva Mission, combining Thai Massage, Cranial-Sacral, and Healing Touch modalities into her Therapeutic Yoga sessions, Hamsa’s work is compassionate, intelligent and deeply connected to Spirit. Hamsa believes firmly in the transformational potential of a balanced practice as a portal to our True Nature and the Divine. She is committed to finding ways for all people to awaken to, and embrace, the intelligence of their body-mind to facilitate consciousness evolution. Hamsa will be an instructor with both the Yoga and Health & Nature Retreats. Courtney Wren-Mabbutt, Masters of Clinical Social Work, is a therapist offering counselling in Nelson and Winlaw, British Columbia. She works with individuals, couples, children, families and groups. Courtney is trained in Somatic Experiencing (returning the nervous system to it's healthy rhythm), Mindfulness, Embodied Spirituality, Relational/ Attachment/ Bonding/ Intimacy, Systemic/ Family Constellations, Generational healing, Earth Based Medicine, healing in nature, Ceremony, and heart-based healing. Four words guide her work: Embodiment~ Connection~ Flow~Love. Courtney understands life as a somatic-embodied-felt experience. Her own healing and that of others has shown her that the journey is to connect to and listen to the organic wisdom of our selves, our beings and our bodies as life moves through us and as we co-create with life. She holds space for people to learn how to listen to their experience compassionately and mindfully and to live from this awareness. She understands that our bodies and souls heal when we are in healthy connection to others, ourselves, & the land. Courtney co-facilitates our Women in Nature retreats. Chris Berger has been a Social Service Worker in the school system in the Slocan Valley of BC for seventeen years, working with high-risk youth and their families. She also does private counselling for individuals and couples and has been facilitating young women’s circles. She is passionate about Restorative Justice and helped create a program in 2002 for the Kootenay region. She has sat on different Boards, founded and co-produced a major music festival for seven years and is an all round giving community member. Shanoon is an Environmental Educator, who has a science degree in Earth Sciences and worked as a Park Naturalist in both Alberta and BC parks in the 1980's. In the Kootenays she began an Adventure Snowshoe Program back in 1990, in which she still gets students out exploring, discovering and engaging in their bio-region. She Is a teacher that works for both Wild Voices for Kids and Wildsight where she offers a multitude of school programs every season including Wild Food and Medicine programs, Pond, River and Lake Watershed Connection programs, as well as Habitat and Forest Ecology programs. She was just awarded the Columbia Basin Environmental Education Award of Excellence and holds her Wilderness First Aid.